It’s time for Jose Melendez’s KEYS TO THE HOT STOVE. 1. With pitchers and catchers reporting in just a few weeks and ending the darkest part of the winter, Jose thought this was as good a time as any to for Jose to review the Red Sox’s major off-season acquisitions. Unfortunately, they haven’t made any, so Jose will talk about two injured pitchers and a rehashed catcher instead. Of all of the Red Sox acquisitions this off-season, Jose loves this one the most. Yes, Penny struggled his way to a 6-9 record and 6.27 ERA last year, but Jose just sees so much upside in the guy. It’s not just that he had a terrific 2007, starting out 12-1, it’s his broader history. When Penny was just a child of 11, he was already doing most of the work in helping his uncle, Inspector Gadget, solve mysteries and counter a major terrorist network. How could you not want someone with that kind of background on your team? Jose noticed that when he was with the Dodgers last year, Penny appeared to have neither his laptop computer or his laser wristwatch, which may explain his struggles. Both were critical in Penny’s success as a crime fighter. Also, as Jose recalls, Penny got a lot of help from a sidekick named Brain, so the Sox should consider signing Dave Brain, who last played in 1908 to catch for him. Sure, Brain was mostly an infielder, but a 107-year-old infielder can’t be dramatically worse than what we have catching now. An option as starter number five? The way Jose sees it, Smoltz is really a replacement for Curt Euro. It is a tremendous upgrade. Basically, The Red Sox replaced 42-year-old usual starter and sometime closer with a 127 career ERA+ with a 41-year-old usual starter and sometime closer with a 127 career ERA+. Smoltz has 210 career wins, Euro has 216. Smoltz has a 3.26 career ERA playing exclusively in the easier National League, Euro has a 3.46 career ERA in a mix of the two leagues. Smoltz has a career WHIP of 1.17, Euro’s career WHIP is 1.137. Smoltz has 3,011 career strike outs, Euro has 3,116. They are practically the same guy. Almost the only difference is in saves and that Smoltz broke his labrum and Euro broke his diet. So why is this a big upgrade? Because the Red Sox will only be paying Smoltz $5 million not to play, substantial savings over the $8 million they paid Euro not to play last year. That makes Smoltz 37.5% better than Euro. It’s really a no brainer. On the other hand, you do lose Euro’s medical expertise, which came in handy when evaluating the game readiness of guys like Scott Williamson. For all of the griping about the sudden appearance of time travel on Lost last night, Jose has yet to hear any complaints about the Red Sox dabbling in time travel. But shouldn’t fans be griping? As we all know, the consequences of time travel for plot continuity are terrible, and Jose doesn’t want to create any paradoxes that wipe out the 2004 World Series. The mess began when the Red Sox traded Bard and Cla Meredith to San Diego to bring Doug Mirabelli back in 2006. This was an effort to travel back to 2004 and was nothing short of a disaster. Bard and Meredith played well, and Mirabelli caught the knuckleball and did little else of consequence; the Red Sox missed the playoffs. Now the Red Sox are trying to undo the paradox by bringing Bard back, but that’s not how it works. The timeline is already changed, and the consequences are dire. 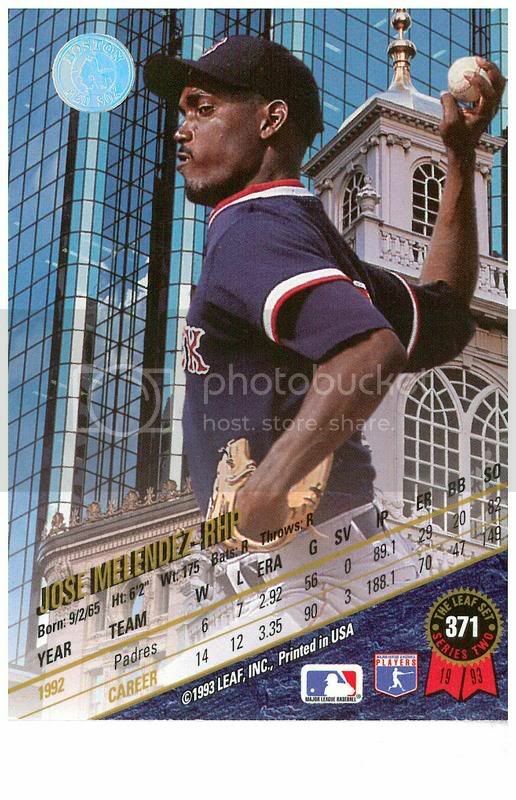 Cla Meredith eclipsed Jose Melendez’s San Diego Padres record for most consecutive scoreless innings pitched, and thereby all but erased Jose from history. Jose supposes the Red Sox could try to reacquire Meredith to set things right, but you know how it is with time travel, trying to fix things only makes them worse. With Jose’s luck trying to correct the time line would have completely changed history, the Red Sox would never have acquired Jose, Phil Plantier would have gone down as one of the great Red Sox busts and this feature would be called Dario Veras’ KEYS TO THE GAME. I’m not Dario Veras, and those are my KEYS TO THE HOT STOVE. It’s time for Jose Melendez’s KEYS TO THE INAUGURATION. 1. Jose does not often write politics in this space. It’s not that Jose doesn’t think about politics, aside from baseball and… something else, it’s almost all that he thinks about. It’s just that injecting politics into something as pure and virtuous as baseball, what with its illegal drugs and “beaver shooting,” seems like a bad gamble. But this year is different. This year Jose is not only setting himself up for disappointment, he is embracing it. He knows that President Obama will not make everything better, that he will not do everything right, and that he will invariably and categorically disappoint Jose and legions of other supporters sometime in the next four years. But Jose is up for it. He is eager to be disappointed by a president rather than disgusted. At this point disappointment would be a huge step up. George W. Bush disgusted Jose with his arrogance and complacent idiocy. Bill Clinton disgusted Jose with this willingness to put his personal appetites and power above the common good. George H.W. Bush, a man known for nothing if not civility, disgusted Jose with an effective yet cruel and gutless 1988 campaign against a decent man, and Ronald Reagan disgusted Jose with his indifference to the poor and his love of substituting his own Horatio Alger fantasies for the real lives of Americans. Is there any wonder against this backdrop of indifference, arrogance, cruelty and will to power that Jose would crave the soothing salve of disappointment? 2. But today there will be no disappointment. Tomorrow perhaps, a year from now most likely, but not today. Today, like millions of Americans and perhaps a billion people around the world, Jose will witness one of those rare moments that suggests that America might be just as good as we aspire to be. It is cliché, at this point to say that Jose never expected to see a black man elected in his lifetime, but he did not. It is not that Jose did not believe America had made progress since those gloomy days of Jim Crow or even that we are a heart a racist nation. Instead, Jose relied on practicality. He did not think that a person of color could emerge from the political process who could be viewed by the nation’s majority not as a “black politician” but as a politician who is black. But Jose was wrong. Wonderfully deliriously wrong. When we wake up on Wednesday, there will still be racism in America. There will still be poverty and we will still be at war. But everything will not be the same. We will not be a society that is “post-racial” whatever that means, but we will, at least, be a society that is capable of looking beyond race, at least on Election Day. Much like, baseball after Jackie Robinson opened the majors to black players, America will be, more than ever, a place where at the highest levels we are using the greatest talents of our finest citizens. 3. It hit Jose this evening as he was watching a clip of Pete Seeger singing, “This Land is Your Land” at the concert in front of the Lincoln Memorial. The old man was plucking away on his banjo and shouting out verses to the crowd with a gleam in his eye that hinted at joy bordering on disbelief. It’s not that Jose agrees with Seeger’s politics, Jose is far too cynical for that, but he is enamored of the idea that someone who was literally blacklisted can be invited into the heart of the American celebration. Redemption, restoration, reunification, these are good values. These are American values. Jose only wishes that Lee Greenwood or Ted Nugent had been invited to sing along, though Jose doubts either would have accepted. Jose hopes that Seeger’s inclusion is a symbol, a sign that not only will this administration be about moving beyond the racial and cultural politics that have been so divisive, but beyond the endless refighting of old battles. Jose no longer cares what you thought about Vietnam, he never wants to hear it in another election again, nor does he want to hear liberalism decried as communism or conservatism as fascism. He cares about a politician’s opinion on Vietnam about as much as he cares about his opinion on the Spanish-American War. Jose cares about someone’s red sympathies about as much as he cares about someone’s sympathies for the Cincinnati Reds. What Jose saw it Seeger’s eyes that was so delightful was the acknowledgement that perhaps America really can change, that it really can be the place that we want it to be. And for today he is right. Today, if not tomorrow, America is as good as its promise.